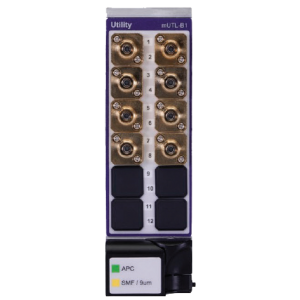 The Multiple Application Platform (MAP-200) Passive Utility Module, mUTL-C1, is designed to simplify the mechanical integration of passive optical components into large automated test systems. A range of passive devices are available including single-mode and multimode optical couplers, Mux/Demux modules for 40G and 100G Ethernet, a quad wavelength filter for shaping ASE spectrum as well as a bulkhead-adapters only module for mechanical mounting of user supplied components. All modules are available with any of six optical connectors types.